Pork walnuts and stilton cheese combine to make a tasty family meal that all the family are bound to enjoy. In a large mixing bowl place the pork sausage meat, the stilton which has been loosely crumbled, the broken walnut pieces, the onion, garlic and herbs. Add the large egg and mix well so that all ingredients are well blended together. Onto a floured board roll out one packet of the ready-made puff pastry to a square of approximately 40 cm. Mark the pastry into thirds and place half the filling mix onto one third of the pastry, roll the pastry and mix over once. Brush the remaining third of the pastry with the egg mix and then roll again so that the final part of the pastry adheres to the rest. Trim the rough edges of the pastry and sausage mix so that it is tidy before sealing down with a little of the egg wash. Run a sharp knife over the top if the pastry several times to make slits for the hot air to release during cooking. Place onto a baking sheet with the double thickness of pastry uppermost – this is the side that should be egg washed and scored with the knife. Repeat the above process with the remaining packet of puff pastry and sausage mixture. Cook in the middle of the hot even for approximately 35 minutes or until the pastry is puffed up and golden brown. This recipe should easily serve four people possibly six depending on appetites. Use a made up packet of sage and onion stuffing as a base before adding the pork sausage meat, stilton, garlic, walnuts and egg for tasty difference. Leave out the sausage meat and add a few chopped apricots for a vegetarian version. The egg wash is a nice finish to the recipe as the pastry is given a golden brown finish that looks most appetising. The remaining egg wash can be used for scrambled egg so is not wasted. The ready-made puff pastry that is easily found in most supermarkets is ideal for this recipe as it save the time and mess of making your own pastry and guarantees good results most times. 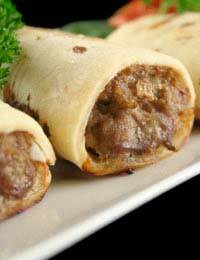 This recipe is ideal party food but rather than serve large portions make smaller rolls by cutting the puff pastry into thirds before portioning the pork sausage mix in long sausage shapes down the middle of the strips and sealing with egg wash and a firm pinch along the edges. Cut into two inch pieces and cook as before. Note: Depending on your oven the cooking times may change so keep an eye on the pasty. You do not want it to cook too quickly or the filling may not be cooked through.